Modern communication and information technologies are having an impact on learning – how we learn, where we learn, when we learn, what we learn and why we learn. Technology can bring the world to the student, providing a depth of approaches regardless of their learning style. Capturing information and deploying it are the skills necessary for success today and in the future. The ability to use technology “anywhere, anytime” becomes the basic skill for all students. 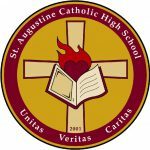 The success of the St. Augustine Information Technology plan will include enrichment of the curriculum and instructional delivery so that all students will become proficient in the use of technology to the extent that their potential will allow. The more commonplace technology becomes in our daily life, the more easily student and staff will acquire the necessary skills to become technologically competent. St. Augustine Catholic High School’s vision for technology is to integrate the use of information technologies in the classroom as a tool for the enhancement, extension, and application of the curriculum. Information technology use has been shown to aid in the development of research and writing skills and to foster curriculum integration. Information technologies in an anywhere, anytime learning environment will equip student-learners with the advanced skills required to meet the challenges and opportunities of the 21st Century. Students will acquire basic computer skills by the conclusion of grade nine. Students should constantly apply technology skills acquired. Student graduation requirements will include technology-related skills. Student learning must occur anywhere, anytime. Students should participate in alternative modes of program delivery with our business-learning partners. Students will benefit from business-learning partnerships that are established with the private sector. The hardware used and curriculum available to students should be re-examined continually and kept current to ensure excellence in program delivery. Students and staff will be given full access to technology and training in its use. Students should be in-serviced on the career opportunities that are available in the Information Technology fields.